Spring time is a good time to check for grade that may have settled around your foundation with the spring thaw. The recommend slope is 6” of fall in the first 10’ away from your foundation. If this isn’t possible just make sure you have positive slope away from the foundation. 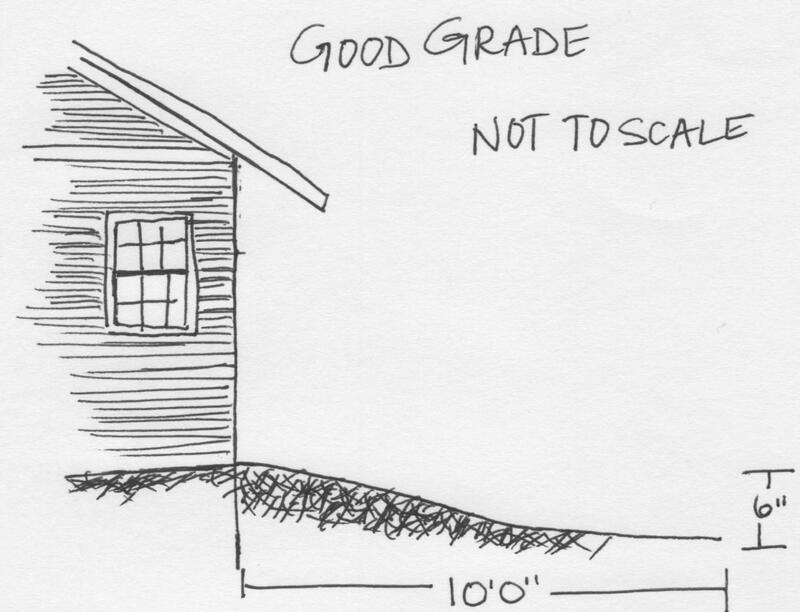 Meaning that the grade next to your home is higher then what it is 5′ away from your home. Don’t be by fooled decorative landscape rock around the foundation. I have seen homes that have reverse sloping soil and just add rock to give the appearance that the grade is sloped away from the house. That creates a pool that will hold water and that will run down along your foundation. Correcting this is not an easy task but it’s worth your time and money. First remove as much of the rock and all layers of plastic that maybe buried. Then add clay or a suitable soil to create the positive slope away from the foundation. Finally install new poly over the soil and put your decorative rock back in place. 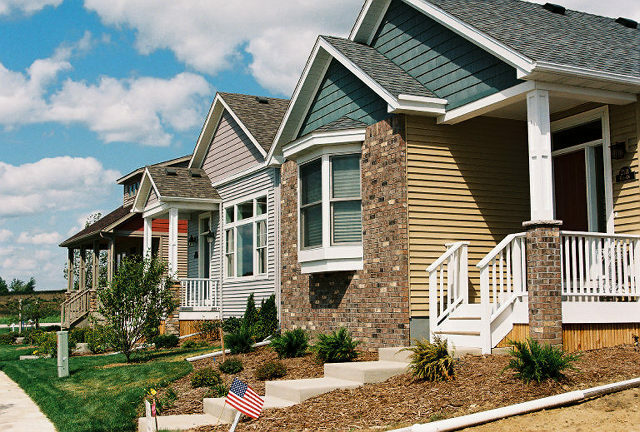 Even in new homes or any newly excavated area from an addition you could have settlement for up to ten years. Keep paying attention to the grade. Time and money spent now to fix any problems will save you time and money if you have a flooded basement. Spending $100s to $1,000s vs. $10,000s is well worth the expense. Before the rain hits us clean out your gutters! If there is too much debris in your gutters the water will not be able to flow into the downspouts and it could cause your roof to leak! The Minnesota Building Industry Foundation has created Home-Smart a website that offers monthly maintenance tips for your home. Have You Changed Your Furnace Filter Lately? It’s that time of year again. Have you changed the filter in your furnace? Part of proper home maintenance is to changer you furnace filter regularly. Some furnaces require you to change it 3 times a year. I like to do them around major holidays, the first is on Memorial Week-End, the second on Labor Day Week-End, and the third is at Christmas time. By keeping your furnace filter clean you are taking one step in improving the indoor air quality of your home. If you didn’t make it out to the Northfield New Home Tour this past week-end make sure to join us this Saturday and Sunday, April 19-20. The presentations are outstanding. View the schedule or look in the directory to find the right presentation for you. Come to the Schmidt Homes model 2105 Ontario Circle at 3pm for Optimizing Your HVAC. The mechanical system is a crucial part of your indoor comfort and air quality. If you have concerns about how to run your HVAC this is the perfect place to get some great tips. Saturday April 12 (tomorrow) is the Northfield Area Family YMCA Healthy Kid’s Day from 9am-12pm at the Northfield Middle School. We will be there! Look for Schmidt Homes right when you walk in the door. We will be talking about Energy Star and recycled building products. I hope to see you there! Let the Home Tour Begin! The time has finally come for the 1st ever Northfield New Home Tour to start this Saturday April 12th! It runs April 12-13 and 19-20 from noon-5pm. Be sure to check out Schmidt Homes seminar about running your HVAC system. Giving the talk will be Better Air, our preferred HVAC contractor. We have worked with Better Air for over 20 years. Be sure to see us on Sunday the 13th at 2110 Erie Drive at 3pm and on the 14th at 2105 Ontario Circle at 3pm. It will be well spent hour!